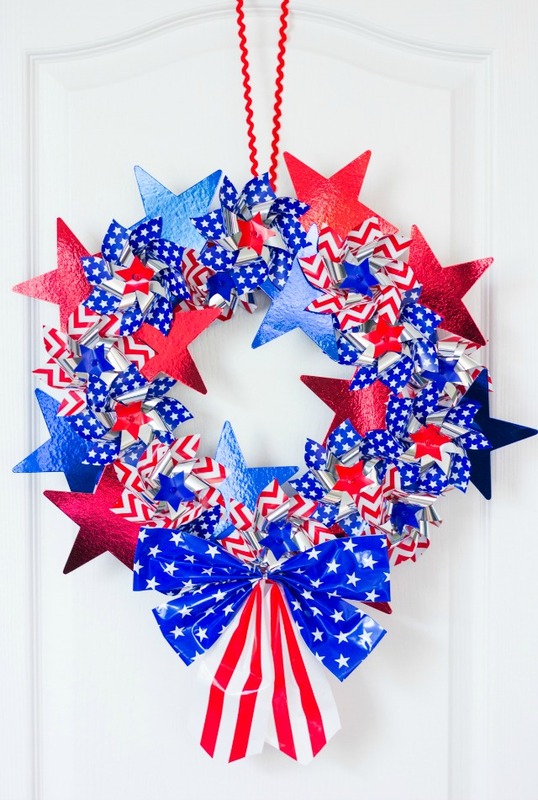 Light up your front door with this patriotic fireworks wreath just in time for the 4th of July! 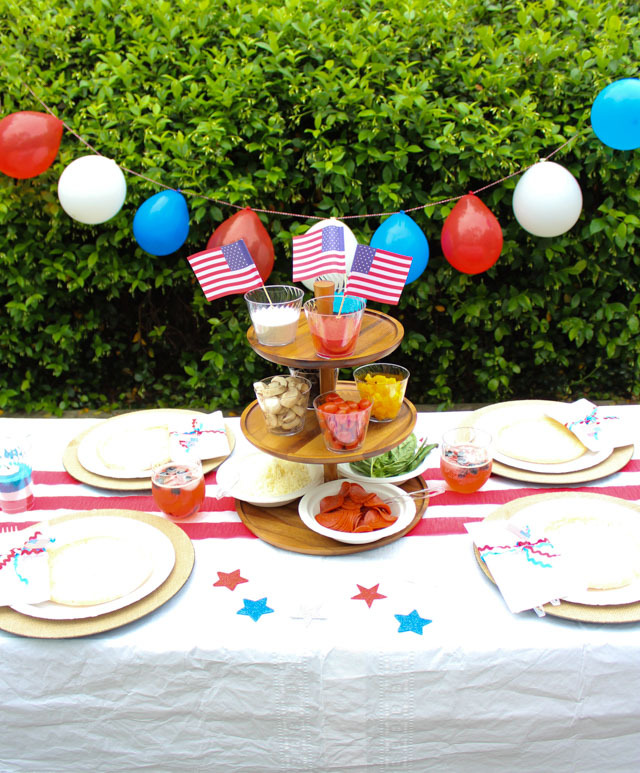 It takes minutes to make with a few supplies from the 4th of July aisle at your local craft store. 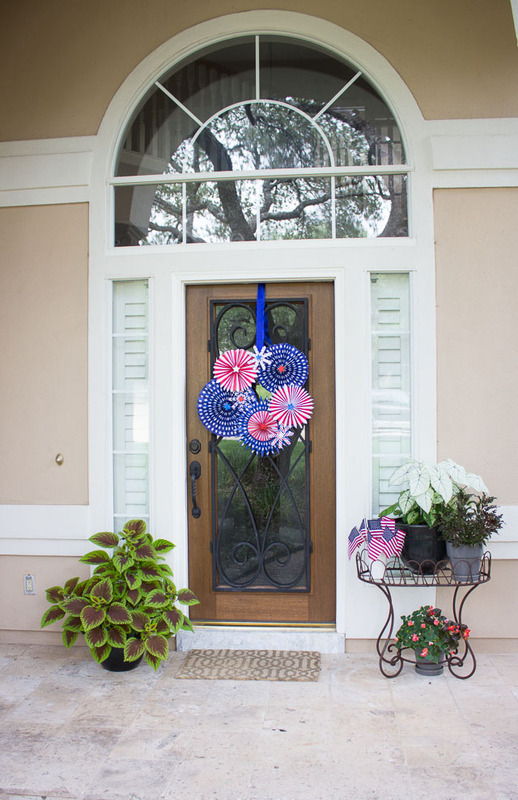 I love the scale of this wreath on our front door – it definitely catches your eye from the curb! 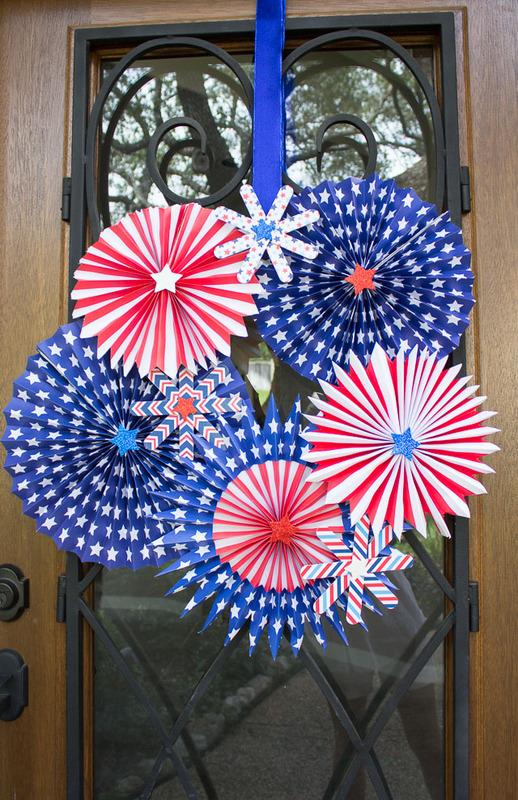 I found these pre-made paper pinwheels, popsicle sticks, and star stickers at Hobby Lobby making the wreath super easy to pull together. 1. 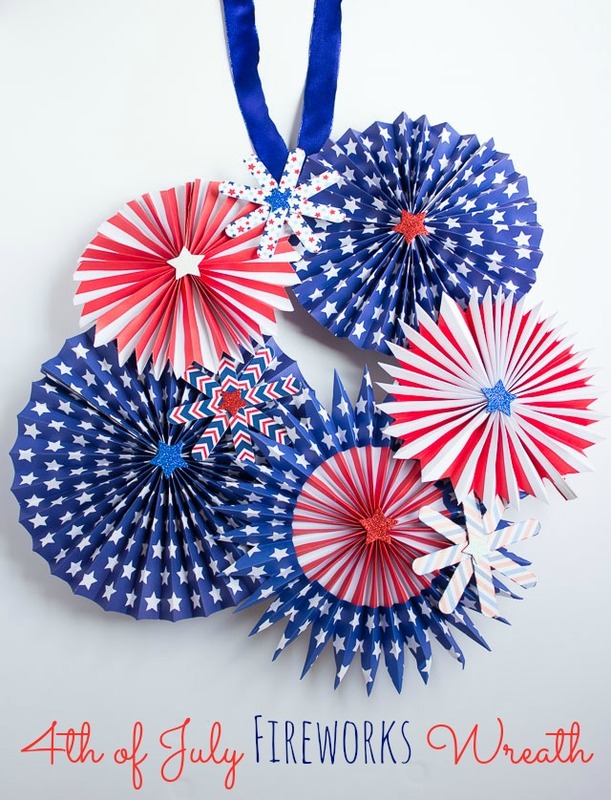 If desired, trim your pinwheels to make them smaller. 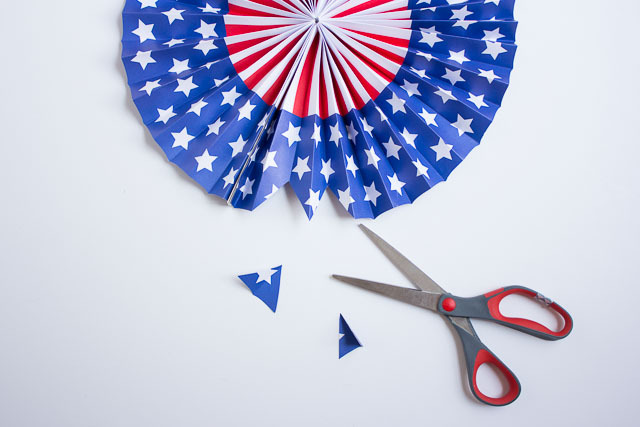 I took a few folds at a time with my scissors and cut around the pinwheel to shorten the diameter. 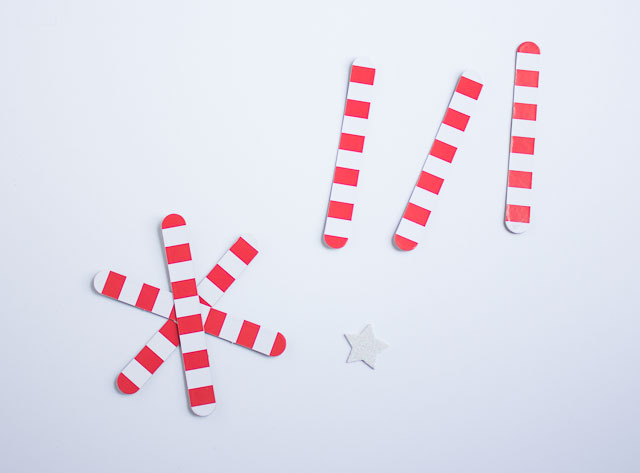 On a couple of them I also made little points by cutting out notches with my scissors as shown below. 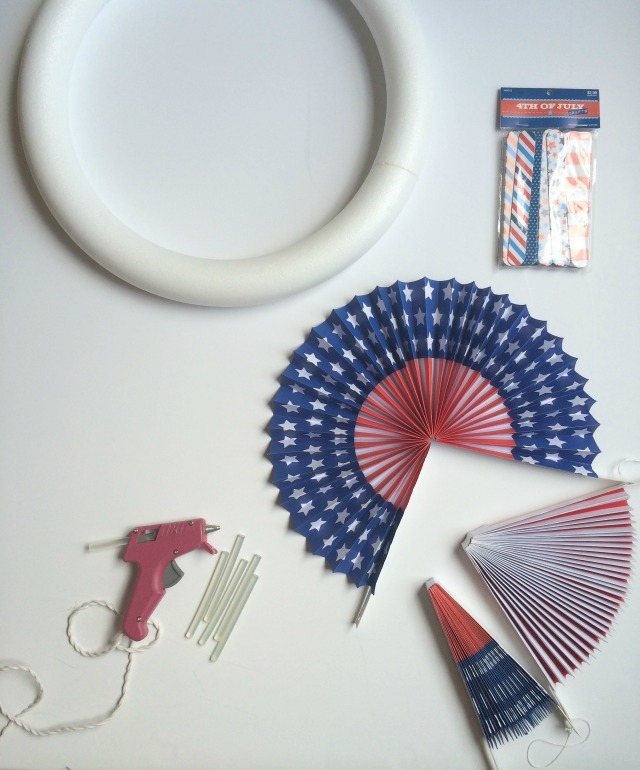 I then hot glued the ends of the pinwheel to stay together as a circle. 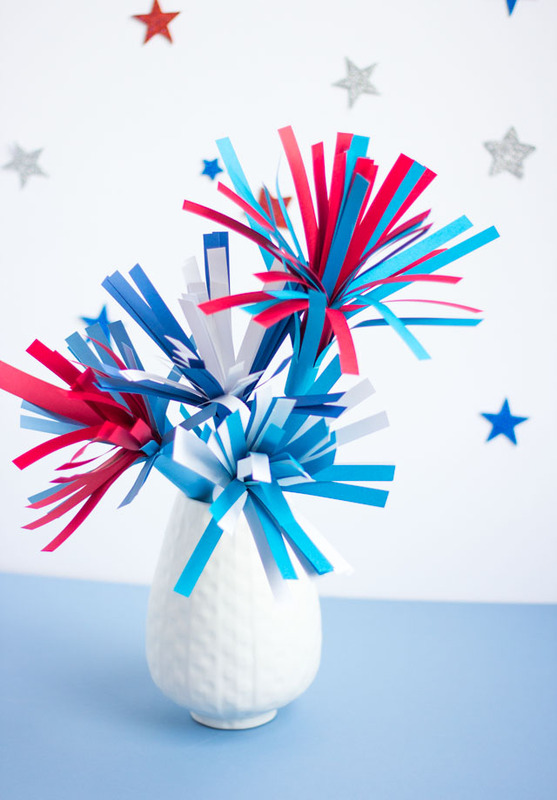 If you are making your own pinwheels check out my easy tutorial! 2. 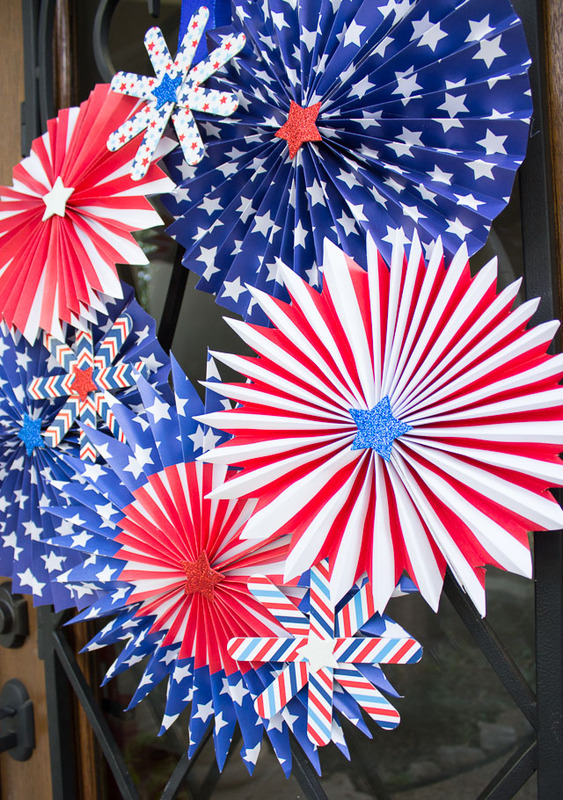 I like to hot glue on a small piece of cardboard on the back of the pinwheel to give it a flat surface area to stick to the wreath. 3. 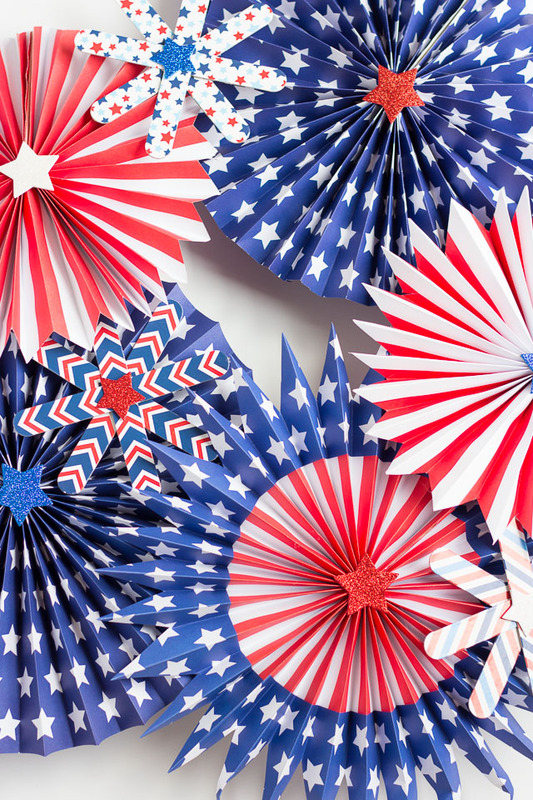 I made a couple additional “fireworks” for the wreath using these printed popsicle sticks. 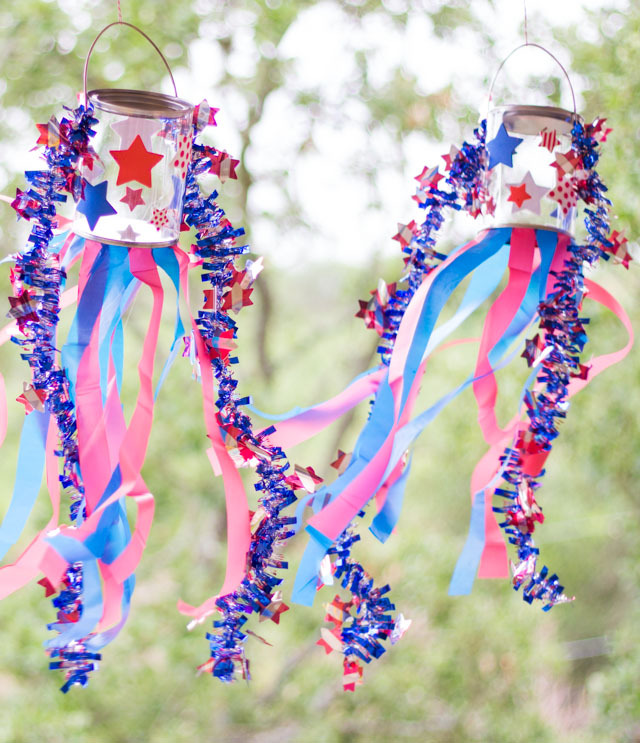 I criss-crossed them on top of each other and hot glued them together. I finished with a sticker on top. 4. 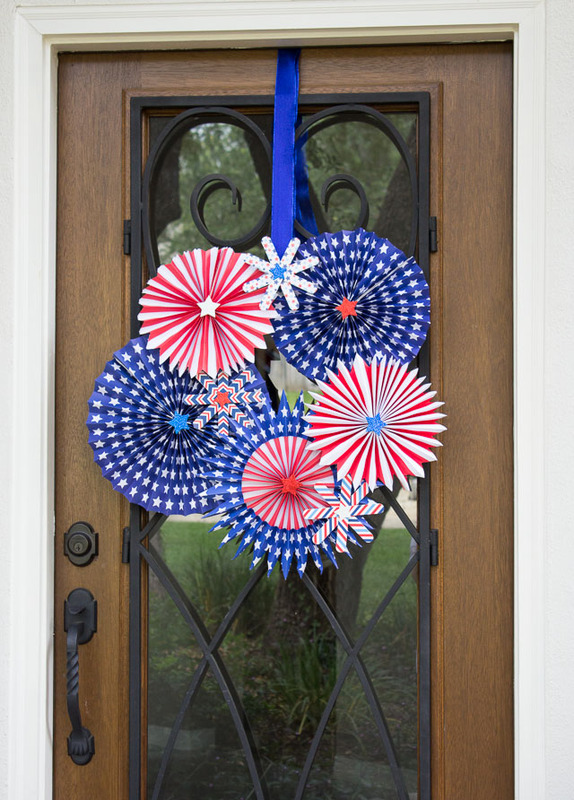 Arrange your pinwheels and popsicle stick fireworks around the wreath form until you have a layout you like. 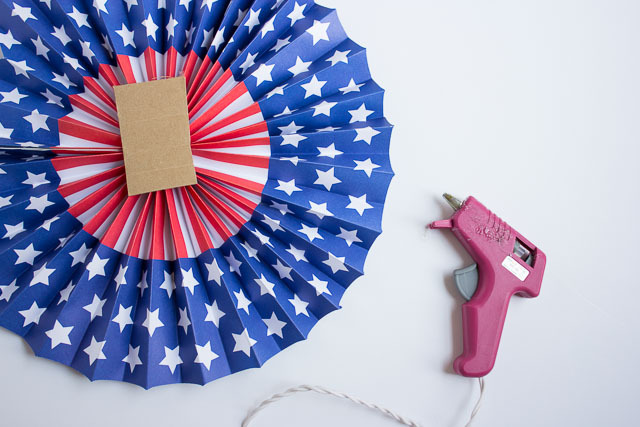 Secure with a generous dab of hot glue and hang with a ribbon. 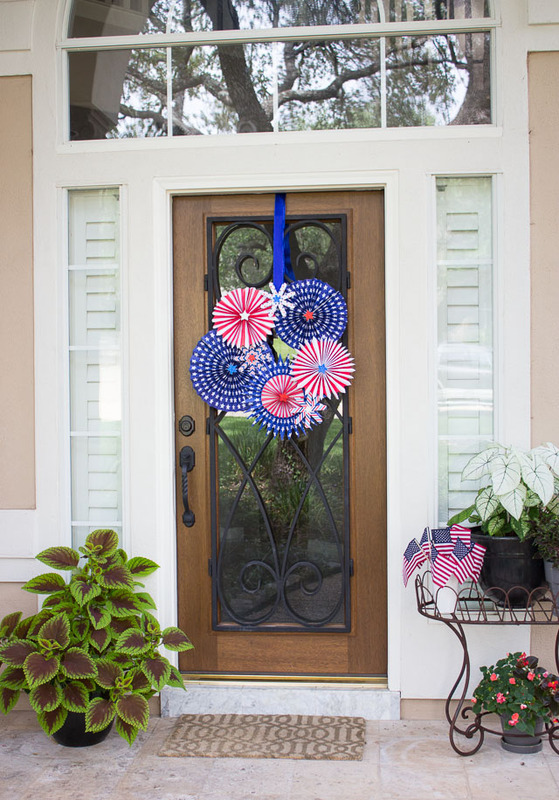 Even though the 4th of July is only a week away, you can make this wreath easily in under an hour and I say, keep it up on your door all of July! 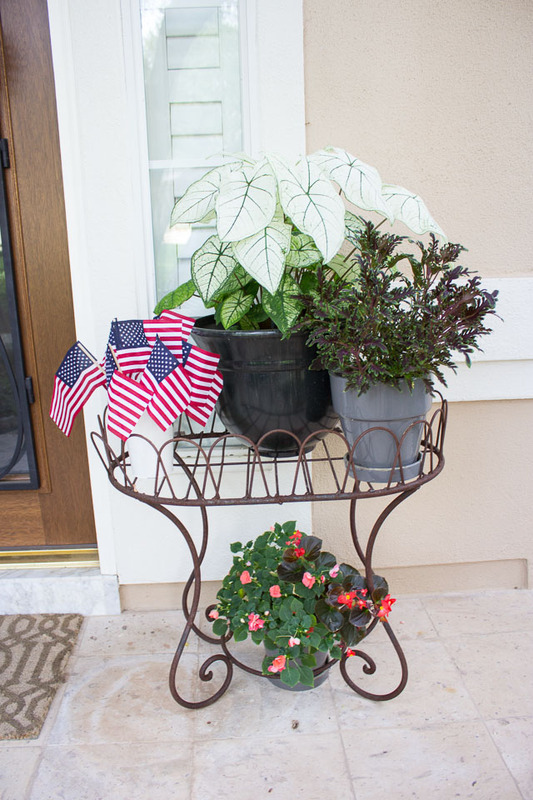 I added a little bucket of American flags from (only $1 for 3 at the Target Dollar Spot! ).